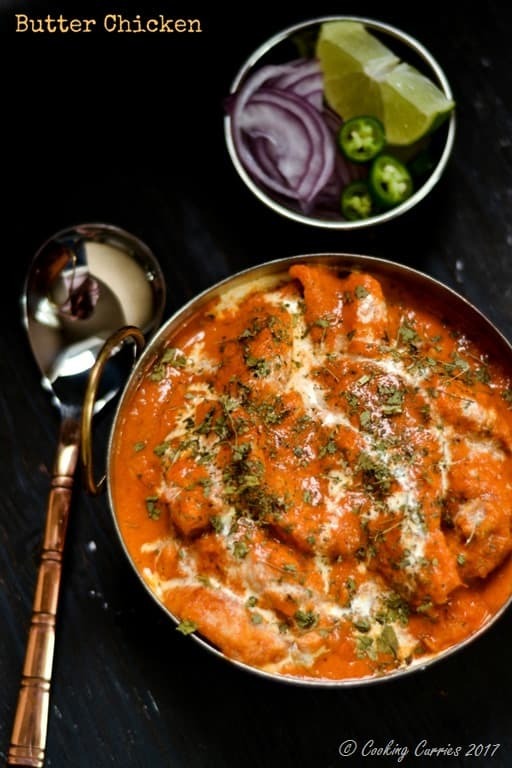 Creamy, tangy and rich tomato sauce gravy coats the marinated and fried chicken pieces to become this indulgence of Butter Chicken or Murgh Makhani, that is a favorite among any who loves a good Chicken curry. 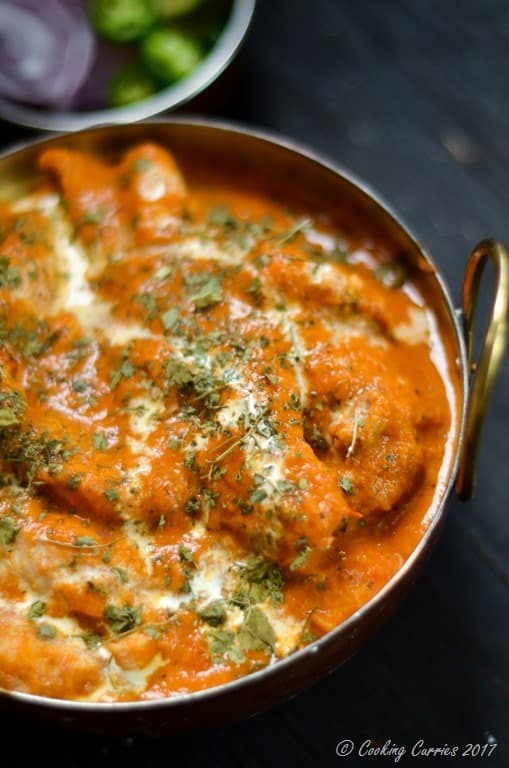 Butter Chicken is typically one of those dishes that you don’t make that often at home but is much looked forward to and ordered whenever you to to a restaurant. The rich tomato base or the makhani sauce is made so with cashews ground together with the onion and tomatoes and the addition of cream towards the end. The heady yet not overpowering fragrance of dried fenugreek leaves or kasuri methi is a signature tell tale of this dish. The secret to making a good Butter Chicken is to be patient and not to skimp on the butter, cashew and cream. The onions and tomatoes need to be cooked slowly in the butter along with the spices to become nice and soft themselves before being ground to a creamy paste. The finishing touches of cream and kasuri methi seals the deal. Disclaimer: this post may contain affiliate links, which pays me a small commission if you purchase through these links, at no extra cost to you. Cut the chicken breast into 1 inch pieces and marinate in garlic, ginger, cayenne, lime and salt for about 30 mins or so. Heat the butter and oil together and add the chicken pieces to it. Fry on each side for about 2 mins each, till the chicken appears to be mostly cooked. Drain and keep aside. To make the Makhani sauce, heat the 2 tbsp butter in the same pan that we fried the chicken, along with any leftover fat in it and add the onion, turmeric powder and kashmiri chilli powder to it. Saute till the onions are soft. Add the tomatoes, cashew nuts, garam amsala powder, green chilli and salt and saute till the tomatoes are soft and mushy. Switch off heat and let it cool down for a few minutes. Grind to a smooth puree in a blender. Bring this back to the pan and let it almost come to a boil. Add maybe a 1/4 cup of water, if it it too thick. Add sugar and the chicken pieces to it. Cover and cook for a few minutes. Switch off the heat and add the heavy cream and sprinkle the kasuri methi over on top and mix well before serving. Note: If you don’t get or have Kashmiri Chilli Powder, you can substitute with Cayenne Powder but reduce the quantity to half. If you don’t get or have Kashmiri Chilli Powder, you can substitute with Cayenne Powder but reduce the quantity to half. Thank you Karyl! I’m sure you will love it ? Loved your butter chicken recipe and how you have included step by step pics. My kids will like this a lot. I will try it and let you know. I love your step-by-step photography. It really makes this dish look doable! I think my hubby would love this one. This is, honestly, one of the easier chicken Curries that you can make! I hope you try it! Thank you! ? Amazing looking meal with lots of the kinds of spices I love so I’m sure it’ll taste real delish! Thanks for sharing! Thank you for the comment Fred. I really appreciate it! These pictures are making me salivate. My favourite curry of all time, the kid’s too. I’ll be pinning this to make very soon. Thanks so much. I love butter chicken! I’ve never made it with cashew nuts before, I have to try this, thanks. I love experimenting with Indian foods. This sounds delicious. Love all the warm spices. Perfect to make a big batch…and the leftovers would be great. You said it right. This is perfect to make a big batch and the leftovers taste better! ? I’m sooo nuts for Indian Food! 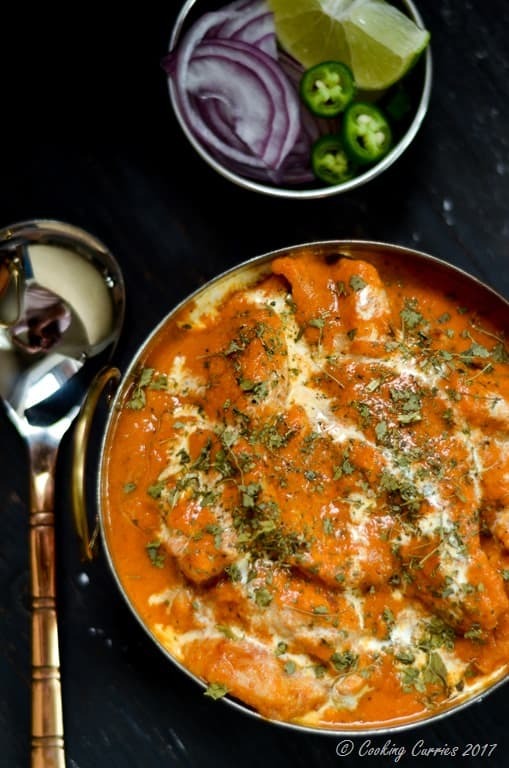 This butter chicken sounds so great, I could eat it every single day if only it wouldn’t be this caloric… Love love love this recipe! 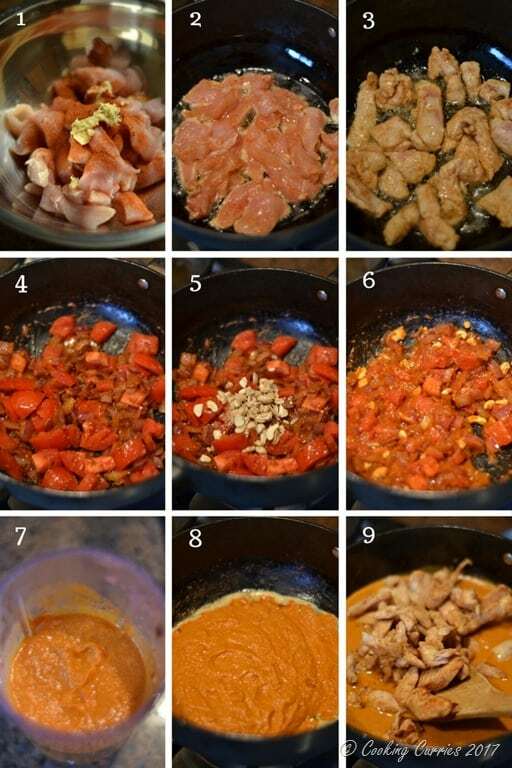 This butter chicken sounds really wonderful and I love that you included step-by-step photos of your process! Can’t wait to try this! 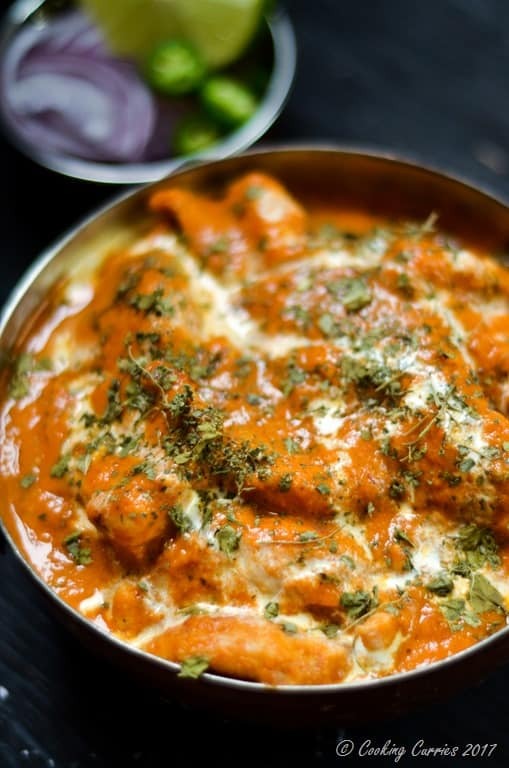 This looks like the PERFECT butter chicken! Oh my goodness, I need this recipe in my life! Yum! Hi Manju. Your chicken is looking very delicious. I also make it frequently because my hubby loves it so much. The only difference between our recipes are the way, we add onion and tomato. I use onion and tomato paste instead of chopped tomato and onion. I can feel the creamy taste of your chicken. No doubt it is very yummy. Nice recipe. I think it is unfortunate that people rate this dish before making it, even if they are good. I, however, made it and it is excellent. Very tasty and not too spicy. Unlike most of those posting I made the recipe. It was very good. It needed a bit of thickening so I added a small can of tomato paste. That was the perfect consistency.